For the pesto- the pesto recipe below is enough to serve 4. Pop half in the fridge to be used at a later date. The pesto itself is 2sp per person. Put the pasta on to boill and pre heat the grill. When the pasta has 5 minutes left, add the broccoli and then, once cooked, drain everything and return to the same pan. Meanwhile, pop all the pesto ingredients in a food processor and blitz until smooth. This will make enough pesto for 4 servings so pop half in a pot and keep it in the fridge for another meal. Keep the other half to one side. Add the remaining pesto to the cooked pasta and broccoli along with the crème fraiche. Pop on a low heat to warm the crème fraiche through (this should just take a few minutes). Season to taste. Pop the salmon on a baking tray, squeeze over a little lemon, season with salt and pepper and add a few crushed chillies. Pop under a hot grill for 6 minutes until cooked through (or to your liking). Finally add a handful of shredded spinach to the pasta pan. Once wilted, taste for seasoning, add a few crushed chillies and a final squeeze of lemon and serve in a pasta bowl with the salmon on top. 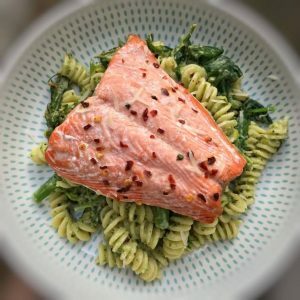 You could shred the salmon and mix through the pasta but I like it left whole. Where is the best place to buy Wild Alaskan salmon to ensure the lower smart points? Gorgeous. Something completely different-we loved it. So glad you enjoyed Becky!